the early hours of Monday, October 17. Premium Times reports that the incident occurred at Hawan Kibo, the boundary between Plateau and Kaduna states. Although the police spokesperson, Terna Tyopev, could not be reached at press time, a police source who confirmed the attack said the officers’ rifles were also taken away. The source said the incident occurred at the same spot where two police officers attached to the special task force on Jos crisis were shot and killed earlier in the year. 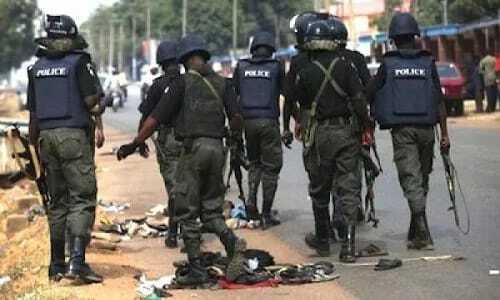 Monday’s killing occurred about 24 hours after gunmen raided Godogodo community, a settlement in Jama’ar Local Government Area of Kaduna State. Several residents have since abandoned the community while travellers on the Jos-Kafanchan-Abuja road have also deserted the route. Hawan Kibo has been in the news lately for gun crimes and killings involving police officers. Two months ago, dare-devil armed robbers reportedly attacked a bullion van owned by the Central Bank of Nigeria (CBN). According to a report by the Vanguard, the attack occurred at the Hawan Kibo hills, near Riyom in Plateau state.